Pupa: The pupa forms inside the mine. Notes: Initially in mid-rib then upper surface blotch. Only miner on Holly. Widespread throughout. The early mine is green (as shown). The oviposition scars can be seen on the midrib (underside of the leaf) for this species. Occasionally long thin mines (reminiscent of Lyonetia clerkella) are seen - Hering (1957) thought they were due to parasitism of the ilicis larva, but research by Ellis (2000) indicated that the cause was crushing of the larva by callus formation before it was able to form a blotch. Sometimes a larva will break free from this thin gallery and form a blotch (Ellis, pers. comm). 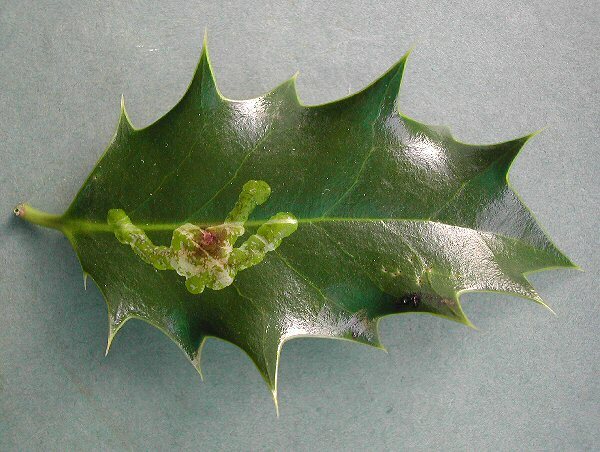 Ellis,WN (2000) -Biological notes on the holly leaf miner, Phytomyza ilicis (Diptera: Agromyzidae). – Entomologische Berichten, Amsterdam 60: 165-170. Lewis, T & Taylor, LR (1967)- Introduction to experimental ecology: i-xi. 1-401. Academic Press, London.